Does anybody on myLot watch Charlie the Unicorn? I know it's a somewhat-random question, but is anyone here a fan of that famous video? 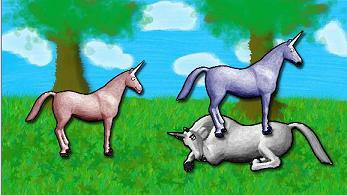 Charlie the Unicorn 2, in my opinion, was better than the first. I showed it to all of my friends and they all loved it. The YouTube Live video was pretty much a chuckle, as it wasn't nearly as funny as the other two, but what can you expect out of such a short clip? I have "Put A Banana In Your Ear" on my Juke, so I guess I'm a fan... heh. Charlie, Charlie, Charlie. WHAT! we are on a bridge Charlie. I love the original animation and I was slightly drunk at the time of watching which made it all the funnier. It is pure genious, but I had no idea that there was a live action video of it. What happens in it? is it a bit longer than the original two? I dont think ive ever heard of charlie the unicorn and at first I thought it was a show but if its clips from youtube ill have to check it out to see if its funny since im up for a good laugh right about now.